It is really dangerous when businesses disengage. You can see what happened in Greece on this front and this could be a harbinger of what can happen to the rest of Europe if we're not careful. What Europe can do to find its own niche is to remove barriers so that people can create new businesses. It doesn't matter that Europe is smaller than China or India. Switzerland is a small country and it's successful. We are now in the same situation as the 1970s - and you cannot create growth by printing money to put into the economy; you only create inflation. What can you do to change the situation in Europe today? There are roadblocks to be overcome. Dialogue and collaboration are the key here and the potential for human beings to collaborate will help overcome roadblocks. Social networks are catching on in this regard globally and helping create collaboration through dialogue. This kind of collaboration is helping to create innovation, too. Research shows most of it appears to be in the US, the Far East...but not much in Europe and that's a little scary. We're using social networks - but not for innovation. Zemsky comments on a question from audience on austerity vs growth..."Germany is still traumatized by inflation....We should keep in mind the (post World War One) Treaty of Versailles and the effect austerity had on Germany at that time." 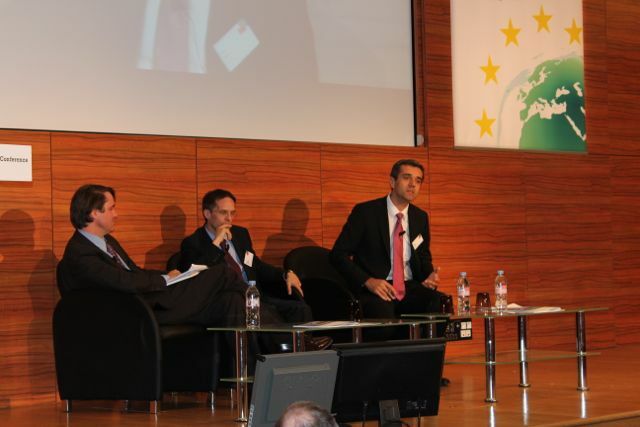 Jim Hagemann Snabe, the Co-CEO of German enterprise software-maker SAP is concerned about youth unemployment. He told INSEAD's conference on The Future of European Competitiveness held July 6 in Paris, that his company addresses this problem in a variety of ways. 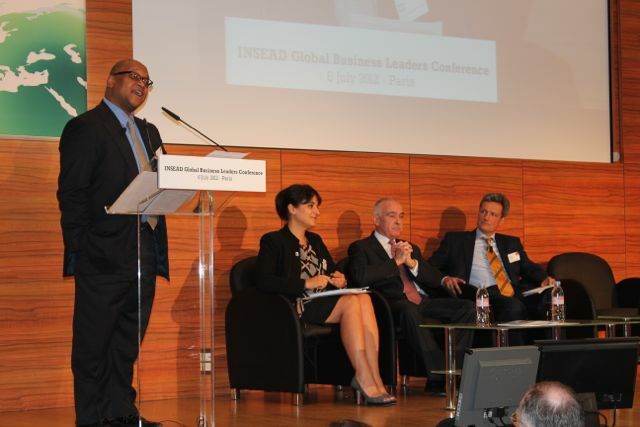 The full interview will be published soon in INSEAD Knowledge (http://knowledge.insead.edu). Europe's advantages are in its human capital - probably its most well defined asset - but in order for growth to take place we need ideas. This is hindered by very high transaction costs and administration costs... we are also in an aging trend so it's more difficult to get to the next level of competitivity; we need to create new ideas. 2. Weakness from a "people" point of view - demographically Europe will lose a high percentage of workers due to demographics but has very high restrictions on immigration. That having been said, China values European talent and wants to access it. 3. Weakness in European education and integration of technology. The Chinese cannot understand how Europe has such high unemployment and yet so many jobs that go unfilled... This is an example of the skills gap. 5. Under-investment in Europe is affecting productivity. 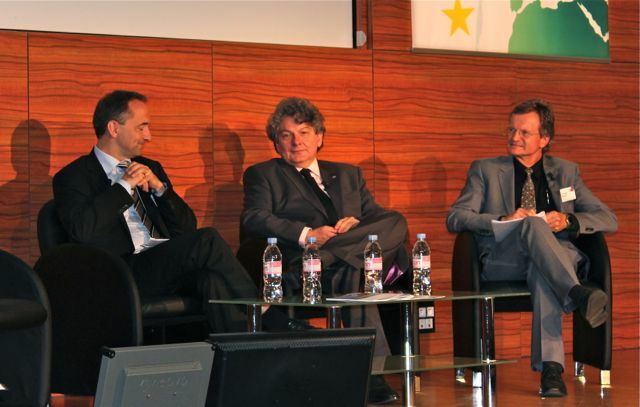 Question: How can public opinion be reflected in European governance and government? Answer: It's difficult to bring public opinion into a global vision or strategy - individual leaders don't have the right to decide globally and it is easy to say "blame Brussels." It is by very small steps, but the only way to get people to trust again in the future is to get people to believe and talk about competitiveness: this is the way to use the best in Europe, and the best in Europe is its people. They have to be part of a new strategic vision. Question: Will we be able to get on the road to competitiveness without continuing the single market and despite the differences within Europe? What is wrong with a federal system? The US has differences between Massachusetts and Mississippi and it still has a unified economy. Answer: The US was built from nothing - what was Mississippi like in the 19th century? It is easy to build from a new landscape. This is not the case in Europe. There is a psychological dimension to this challenge, and we are not all focused on a single European state. I think the main priority is not to say "federalism or nothing," but that we find efficient public policies working with 5, 10, 11 countries rather than to stop until we have a federal system. We have to launch and implement some public policies before this. 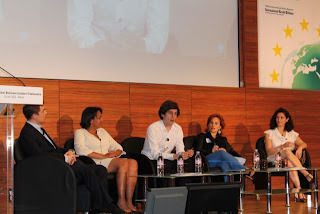 Insights from the Youth Panel - What can we do to make Europe matter again? Valerie Coscas: There is no one definition of innovation - it is what comes next - what comes to most peoples mind first is tech but there is innovation in supply chain, distribution, and many other areas"
Myriam Oufella Ferran: I had a meeting with entrepreneurs that had great products but were too afraid to fail - there is a question of mindset - for me the direct consequence of innovation is creating jobs and new needs. Mads Jensen: Need to start by creating wealth! I see the economy and social society go hand in hand - they are complementary. When asked whether young people would become brave politicians that do something other than make impossible promises to get voted in, Mads Jensen says "I believe that more young people would be willing to go into politics if the institutions were able to do something other than protecting the status quo - until that happens I don't think it makes a difference who is in the positions." When asked whether Europe's youth are ready to make sacrifices, Steven Eichenberger says that with 50% youth unemployment in some European countries - the youth are already making sacrifices. I am convinced Europe will be OK because Europe only is motivated when there are difficulties and this is a very difficult period for us; there is no way to escape. But the EU and the Commission will have to reform as well, especially regarding regulations; not only in telecomms but within European companies. For example, there is no way to create a European champion. We don't train enough engineers in Europe, and that's a big concern I have. We need to encourage young people to return to scientific studies. We need more fiscal stability especially in France. In the last five years there have been new policies introduced every week. You have new taxes, new regulations too often. We cannot move ahead without some more fiscal stability - it is impossible. The world is going digital. Telenor and SAP are drivers of the solutions to take manufacturing output into the service space. This will continue to happen, but at the same time Europe is a latecomer to bringing new broadband services (4G) to Europe - they have lost momentum and mobility to the US over the past few years. The US has taken strong decisions to make possible rollout of 4G. This is a regulation issue. The biggest challenge is youth unemployment. The (social) security rules in place in some countries in Europe slow down progress. What if we were permitted as countries to retrain people? The world is moving into a new area and we may not have the right skills. Europe needs a commitment to re-educate of people. Europe doesn't get more productive or competitive because we lay off people and then can't find the people we need for the future. On labor costs: It costs SAP five times or to hire a German technology worker than one in India. Does that mean if we hire five Indians instead of one German and we get more productivity? No. You don't go into India for cheap labour; you go there for the talent. There has to be a global mix. "The next decade will be the most difficult for Europe," said Thierry Breton... currently global head of consulting company Atos, former French Finance Minister and former head of France Telecom/Orange. He is seriously concerned about debt levels because it puts France at great risk to market gyrations. France has doubled its public debt in the past decade and is still increasing borrowing. Real financial stability will come from reducing pubic debt and therefore market exposure and by forming close alliance with Germany on economic matters. He agrees with Jean-Francois Copé's support of the decision taken last week by European leaders to support European banks and further consolidate the EU's financial systems. Breton believes that one way or another "we will reform our continent." And he reminded the audience that the three leading consulting companies in the world are European: Accenture, Cap Gemini and Atos. 1. We looked at our company and said we need to drive an agenda of innovation because it enables opportunities for young people to get jobs and it enables the development of innovation. We are driving our own capabilities to innovate, to do that speedily and to develop new technologies. Thus far we have had 9 quarters of double-digit growth and this shows that if you focus on innovation - you can also have growth. 2. We have a huge commitment to what we call "the power of small" because it is with the SME's that innovation comes. In Europe every second job created is within a SME and they don't need headcount growth to grow revenues. Innovation therefore can be fundamental to the growth of an ecosystem of small and medium-sized businesses." Scandinavia is just beginning to grow and develop together, but it also has shifting governments, said the President and CEO of Swedish telecomms operator Telenor Jon Fredrik Baksaas. "But we are able to come together on how to spend the richness of North Sea oil profits." He pointed out that it is only since after the Second World War that Scandinavian countries have been able to develop both alone and in parallel while continental Europe has had this ability for centuries. He cited the region's unified response to terrorist shootings in Norway a year ago as an example of collaboration within Scandinavia. "The Swedish economy is about manufacturing, worldwide looking with strong brands, while the Norwegian economy is more about natural resources. The Finnish economy broke down essentially after the collapse of the Soviet system in 1989-90 but regrouped, joined the Euro and has rebuilt itself. These are all open economies and are all dependent on international trade agreements to create value and to participate in global growth. He adds: "and they don't pose a military threat to anyone..."
What is Competitiveness and Where Does it Live? Does European Competitiveness Have a Future? 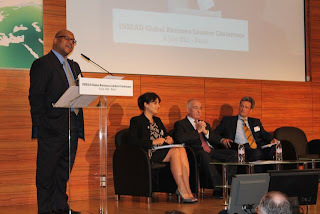 INSEAD 2012. Powered by Blogger.